SAN DIEGO--(BUSINESS WIRE)--Jan. 14, 2014-- Illumina, Inc. (NASDAQ:ILMN) today announced the immediate availability of a transformative addition to its industry-leading next-generation sequencing portfolio with the launch of the NextSeq 500 System. The new sequencer packs high-throughput performance into an affordable desktop form factor, enabling researchers to perform the most popular sequencing applications in less than a day. 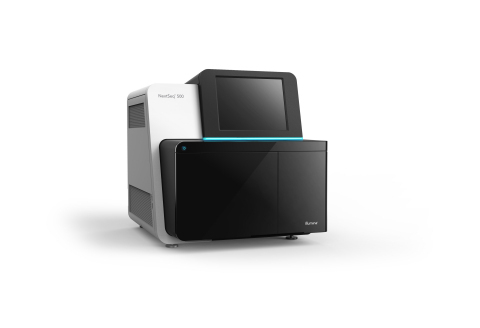 The NextSeq 500 System is priced at $250,000. The NextSeq 500 System delivers the power of high-throughput sequencing with the load-and-go simplicity of a desktop sequencer, effectively transforming a broad range of high-throughput applications into affordable, everyday research tools. Its push-button operation delivers a one-day turnaround for a number of popular sequencing applications, including one whole human genome and up to 16 exomes, up to 20 non-invasive prenatal testing samples, up to 20 transcriptomes, up to 48 gene expression samples and up to 96 targeted panels. With its streamlined informatics, sequencing data can be run through a range of open source or commercial pipelines or instantly transferred, analyzed, and stored securely in BaseSpace® or the new BaseSpace® OnSite for researchers needing an on premises solution. Users also have the flexibility to switch to lower throughput sequencing as needed, and while other platforms require several pieces of specialized equipment, the NextSeq 500 System integrates cluster generation and sequencing into a single instrument. Data is generated in as little as 12 hours for a 75 cycle sequencing run and less than 30 hours for paired 150 cycle reads. The new system is supported by the full suite of Illumina sample preparation and target enrichment solutions, offering library compatibility across the entire Illumina sequencing portfolio. Its configurable output supports a wide range of applications and sample sizes with the accuracy of Illumina sequencing by synthesis (SBS) technology. HiSeq X™ Ten is the world’s first system to deliver full coverage genomes for less than $1,000. Purpose-built for large-scale human whole genome sequencing, it enables population-scale sequencing of tens of thousands of samples per year with high-quality, high-coverage SBS data, delivering a comprehensive catalog of human variation within and outside coding regions. HiSeq® 2500 System is the proven high-throughput powerhouse that enables efficient sequencing and large-scale studies at low operating costs. In Q2 2014, with the addition of recently announced 1T kit capabilities, many currently installed HiSeq systems will be capable of producing 1 terabase of sequencing data and run up to 10 whole human genomes in six days. MiSeq® System delivers low-complexity, targeted, small-genome sequencing for individual scientists who need a higher-quality view than they can get with capillary electrophoresis, PCR, or any competing offering. MiSeqDx™ System, designed specifically for clinical laboratories, is the first FDA-cleared in vitro diagnostic next-generation sequencing system. The NextSeq 500 System is now shipping. For more information, visit www.illumina.com/nextseq.